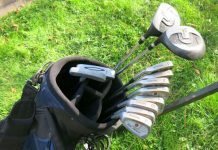 Left-hand golf clubs. Spalding Pro Impact Bi-Metal size medium. 3-9 Irons, P, 1 and 3 drivers, Fairway Final Touch putter. Incl bag and cart.